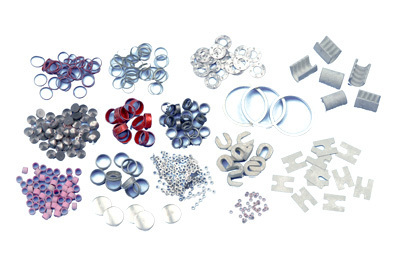 Preforms are tin-based alloy parts that are made to measure for specific applications. They can take the form of squares, rectangles, washers, collars, rings or sleeves. They may also feature an internal or external flux whose activation depends on the application. They enable the creation of soldered joints where the quantity of the alloy is perfectly measured. They are used in areas such as semi-conductors, aeronautics, the automotive industry and electronic and mechanic assemblies. They complement the METACONCEPT Group’s tin-based cream or tin-silver cream and solid or cored wire. Waste originating from the use of these products can be recycled.Contact our recycling department to find out more. Preforms are used as part of manual or fully automated processes. Have you defined the type of application ? Contact us. Our technical staff will be happy to assist you in choosing the most suitable preform. The table below shows the most commonly used alloys in soft soldering with different types of flux. The METACONCEPT Group can look into creating any type of alloy upon request. Alloys: tin-indium, tin-bismuth, low melting temperature alloy. Please do not hesitate to contact us. Comments: Always use an appropriate flux.Contact our technical department to ascertain which product is most suited to your application. Preforms can be used in all brazing applications where the quantity of alloy must be very closely controlled. Preforms may also be used to create tin-based fusible parts with a low melting temperature. The effective use of preforms demands a rigorous and faithful implementation. Contact the METACONCEPT Group’s technical department who, after selection of the alloy and its form, will provide the appropriate implementation sheet.